The negative effects of a diet high in gluten are increasingly becoming clear to researchers, health care practitioners and gluten-sensitive individuals. A prospective five-year study, by Monash University, followed 72 patients on a gluten-free diet. Results showed that their gut health improved significantly after one year on a gluten-free diet, with a continuous improvement up to five years later. The study reinforced that there were clear long-term benefits in following the diet, even for those who don’t present with gastrointestinal symptoms, said lead researcher Dr Evan Newham. Figures show 7% of the population are gluten sensitive, and more than 20% are avoiding gluten and now buying gluten-free products. However, individuals who are gluten-sensitive may find it difficult to follow a restrictive diet – especially during festivities or family celebrations – or occasionally consume a gluten-containing food by mistake. Gluten doesn’t have to be the ‘bad guy’ with science showing that special enzymes can be supplemented to assist with the digestion of gluten. Gluten is a large protein that is comprised of two fractions, the glutenins (55%) and gliadins (45%). Both fractions are rich in proline and glutamine and have different levels of solubility. Present in wheat, rye and barley, gluten makes up a large portion of many people’s daily diets in the form of bread, pasta, cereals, biscuits, crackers, sauces and condiments. In gluten-sensitive people, exposure to gladdens may result in an immune reaction and symptoms of intolerance, such as headaches abdominal complaints, diarrhoea and joint inflammation. A blend of protease enzymes may assist in the normal digestion of proteins and the maintenance of healthy digestive function, helping to metabolise specific proteins such as gluten and gliadin. If you’re struggling to adapt to a life with gluten sensitivity, a proteolytic enzyme blend may be a good option to help break apart difficult-to-digest foods. 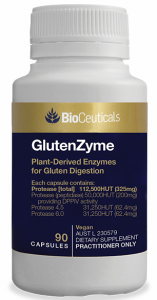 Bioceuticals GlutenZyme contains plant-derived enzymes for gluten digestion. It contains a combination of three different proteolytic enzymes isolated from plant sources. GlutenZyme assists in the normal digestion of proteins including gluten and gladden, and the maintenance of healthy digestive function. Its important to note, however that this is not something to be used by Coeliac sufferers who have a specific allergy to gluten. 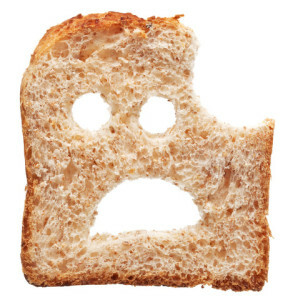 Although, it may mean they are able to tolerate very small amounts of hidden gluten in certain foods. Are Grains The Cause of Your Pain?